Nine years ago, I walked outside to the sound of a truck backing up my steep driveway. I had been shopping around for inexpensive furniture for my guest bedroom. My mother spotted a set of vintage bedroom furnishings intended for a little girl's room, complete with dresser, hutch, bedframe and desk set. She paid $50 at most for the set. Who would have thought almost a decade later the furnishings would be transformed into practical gardening storage for outdoor use! I have walk-in space under my front porch. A back porch, a covered porch, or a patio will be plenty of room for a simple gardener's bench. I placed my gardener's bench in the vicinity where I do most of my gardening which is in the front of the house. While I have multiple flower beds, my main vegetable garden is out front. The dresser shown above is from a vintage furniture collection for a child's room. This is actually a six drawer dresser. The cement wall under my front porch was the perfect space for placing my gardening bench. But I didn't want it the dresser to stick out or be an eye soar. So, I did what I needed to do to make it all blend in....I painted the wall the same color! Outdoor paint includes climate protection. I was able to buy exterior and cement in the same color. If you coat the furniture properly, inside and out, you won't get those musty smells of furniture left in the rain. Before choosing a final color, I tried out two different colors to see which one I liked best. In the small photo below here you can see the different blues. I went with the darker blue because I didn't want the furniture to be an eye soar in the front of my house, and I also wanted a paint color that would help hide dust and dirt. Outside furniture is naturally going to attract dirt. 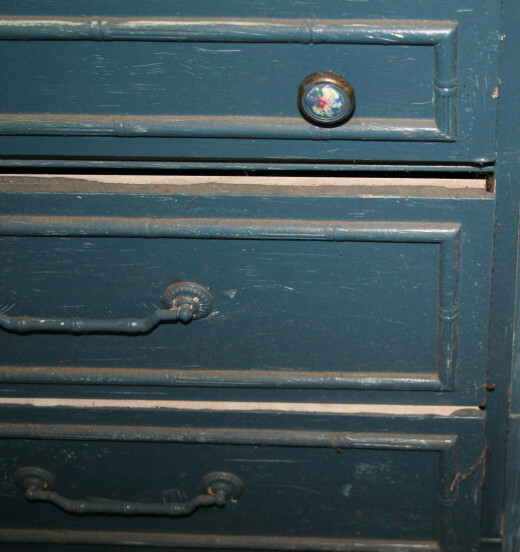 The original handles on the dresser drawers were in working condition. But the dresser was missing a couple of knobs. I replaced them with a floral print knob from the local hardware store. I wanted to keep within the gardening theme but I didn't want to take away from the original look of the vintage furniture. Tip! Keep popsicle or craft sticks on hand. These are a great and inexpensive way to label rows of seeds in your garden! I keep a permanent marker and a package of craft sticks in my gardening bench. I label them and put them in the ground at the end of my seed rows. I have been planting gardens since I was a child. My grandfather kept massive gardens every summer. Flowers were not his specialty, but his parents used to grow and sell gladiolas out of their family homestead in the early 1900s. Reading books about landscaping and gardening is a great way to learn how to organize your gardens. 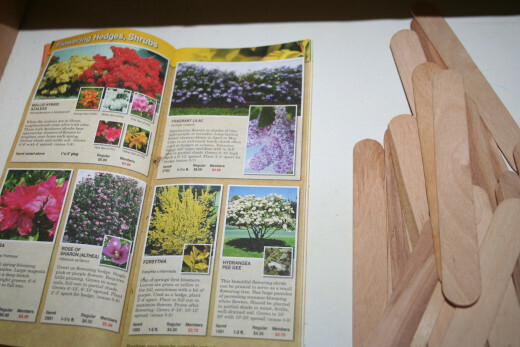 I keep a tree and flower guide in my gardening bench. It helps me learn to recognize what trees can be planted together, how big the trees are expected to grow, and what poisons to look for. I refer to that guide a lot when I'm planting new things. Some plants will not grow under oak trees. It's helpful to keep a handy guide nearby when gardening so you don't have to run inside and mud up your house to look something up on the internet. Of course, I keep my expensive books inside on a tidy bookshelf. But this little pamphlet was a spare and came in the mail for free with a subscription to a tree foundation. 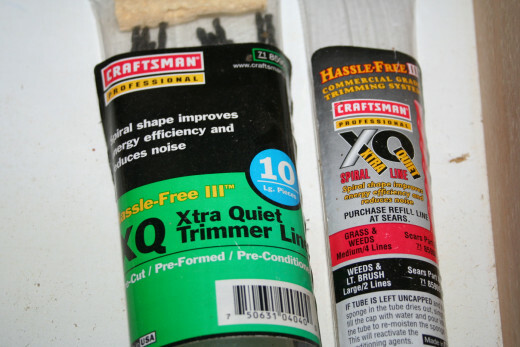 On a hot day in August when there is gardening to do, the last thing I want to do is have to go back in the garage for supplies for my outdoor power tools. I keep my supplies organized in my gardening bench. It saves room in the garage for other tools. Tip! Keep tarps organized and clean by folding them and storing them in your gardening bench drawers! Tarps are useful for a variety of things such as covering your gardens during frosts. 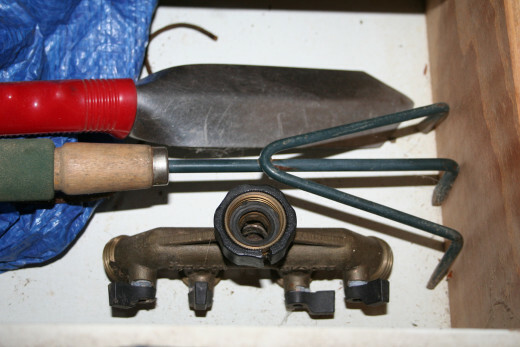 I store my small gardening tools including spare water nozzles in my gardening bench drawers. It helps me keep them organized and easier to find. Large tools such as shovels, rakes, and garden hoes I keep upright against the wall inside my garage. I keep an assortment of seeds on hand. Last year I went to the store too late and had to pay $1.89 a pack for seed. This year I got lucky and found a store selling their brand for 20 cents a package. I never know what I'll be in the mood to plant. 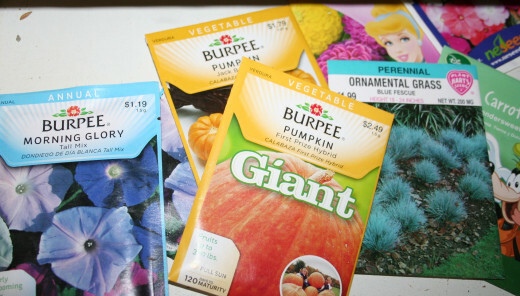 Keeping a variety of seed on hand helps eliminate the need to stop gardening and run to the store for more packets! 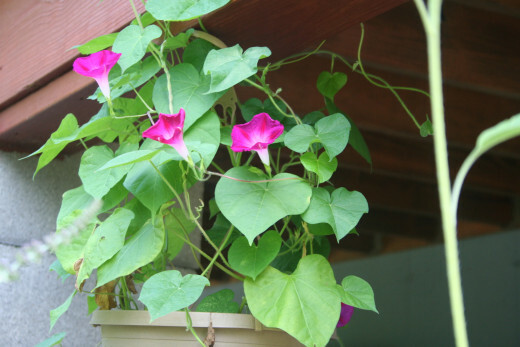 Tip for planting morning glories! Morning glories grow on a vine. 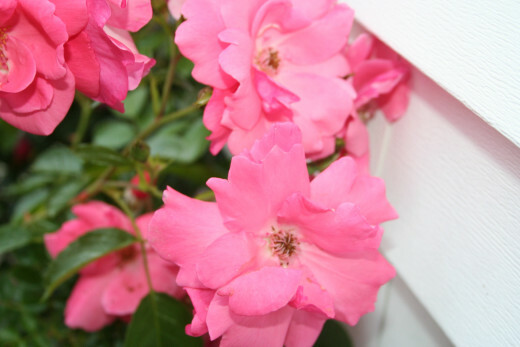 Plant near your garden fence posts or bird feeders on a pole for a beautiful display when they are in bloom. This is where the potting happens. When I have new pots to fill, I use the top of the bench. I can stand up next to it instead of kneeling down in the yard saving wear and tear on my joints and muscles. I also use a portion of the top of the bench for storing larger items like this extra hose holder. The furniture set that I chose to use for my gardening area came with a hutch. This was painted with the same color and outdoor paint as the dresser. 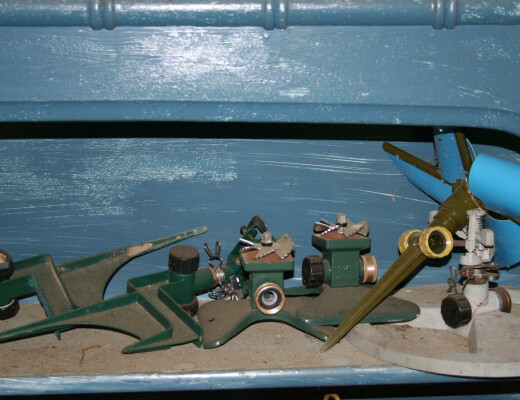 It has three shelves for storing goodies like extra sprinkler, bird feeders, and watering cans. Tip: Arrange different pieces of pottery on the bottom shelf for an artistic look. Tip! 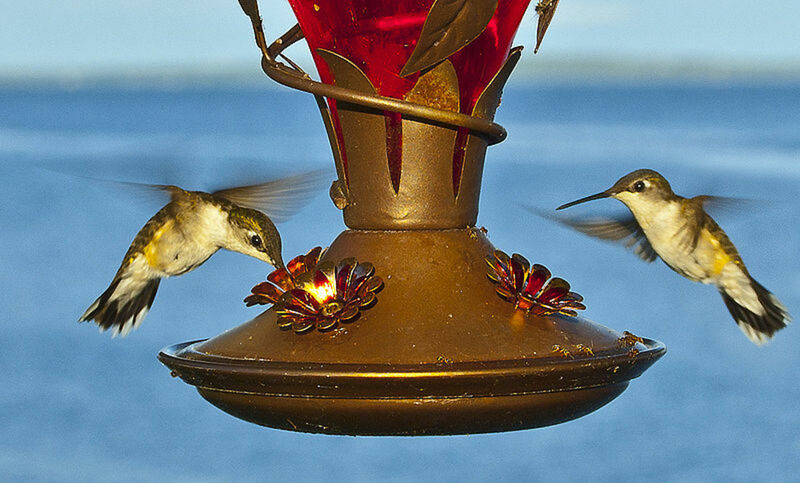 Place bird feeders and nectar feeders away from your home. Garden pests such as ants love sweet nectar meant for the birds! Ants and bees love sweet nectar! 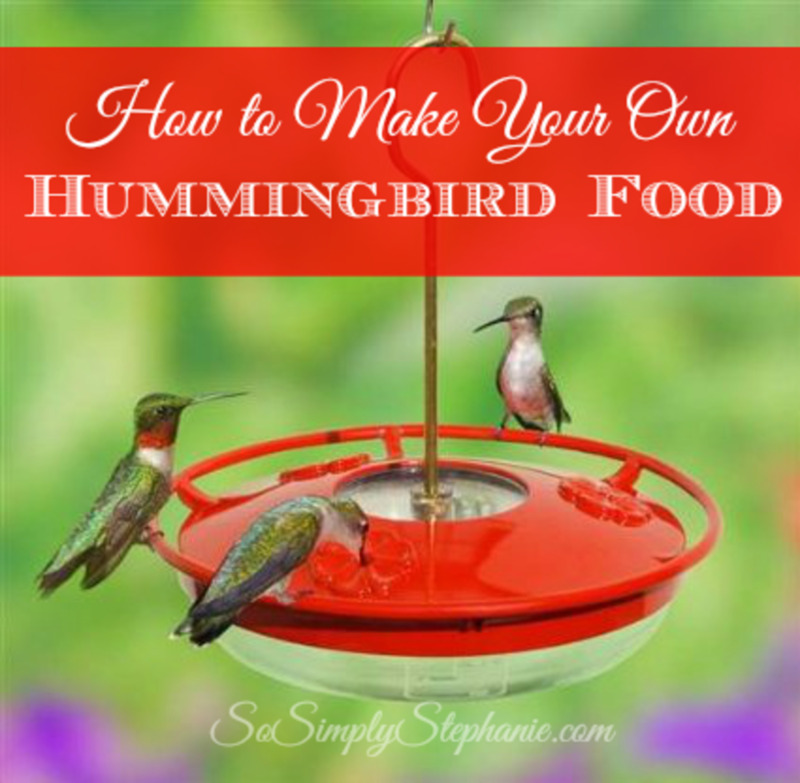 Keep oriole nectar, orange slices, and hummingbird nectar away from your home. 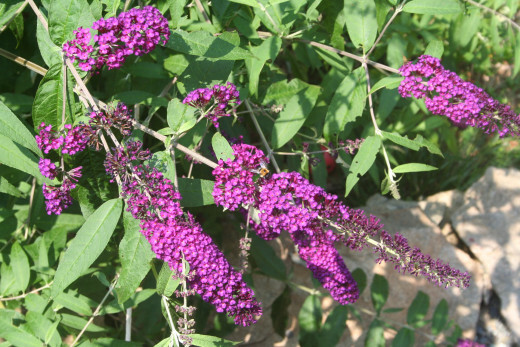 I bought this butterfly bush when it was put on a clearance rack. It was only a foot tall then. Now it stands about 8 feet tall in just a couple of years. 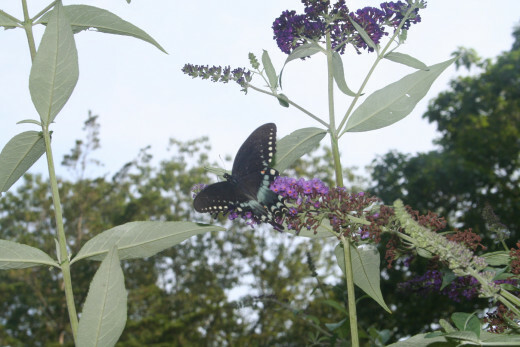 This photo was from last year as the butterfly bush hasn't blossomed yet this summer. No matter what your gardening style, a gardening bench is great for storage and de-cluttering the garage. Having a shed works great too but not everyone has space or funds for a shed. Now that I have a space for my gardening bench, I also keep extra wound-up hoses neatly stored under the porch, along with extra lawn chairs. Everything fits neatly against the cement wall without being an eyesore. I have a huge butterfly bush planted in front so it gives me added privacy. 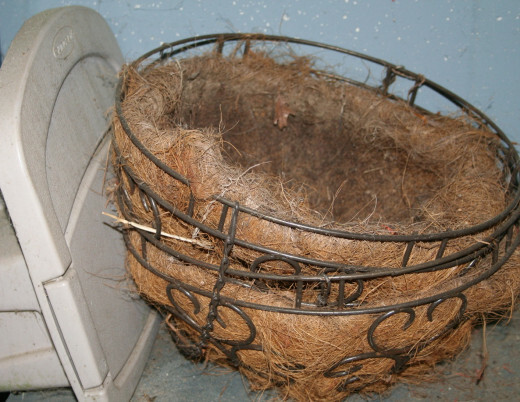 Before I had a gardening bench or storage area, I was relentlessly searching for items in the garage. It was such a waste of time and energy. Here I have everything organized and available when I need it. 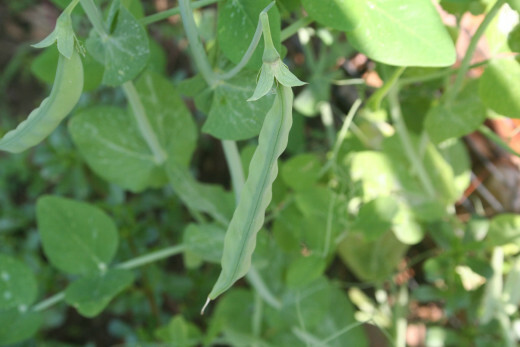 Bush beans grow low to the ground and in abundance. I have a herb garden on the side of my house with rosemary, lemon thyme, and basil. 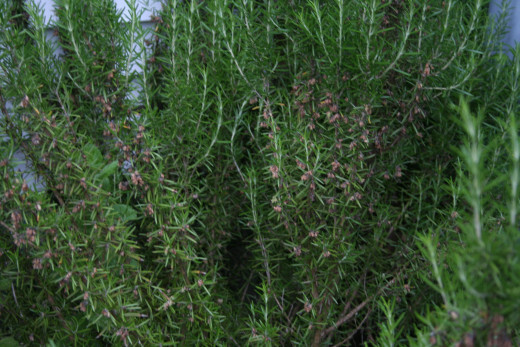 This is a photo of a rosemary plant that has grown to about 3 feet tall. 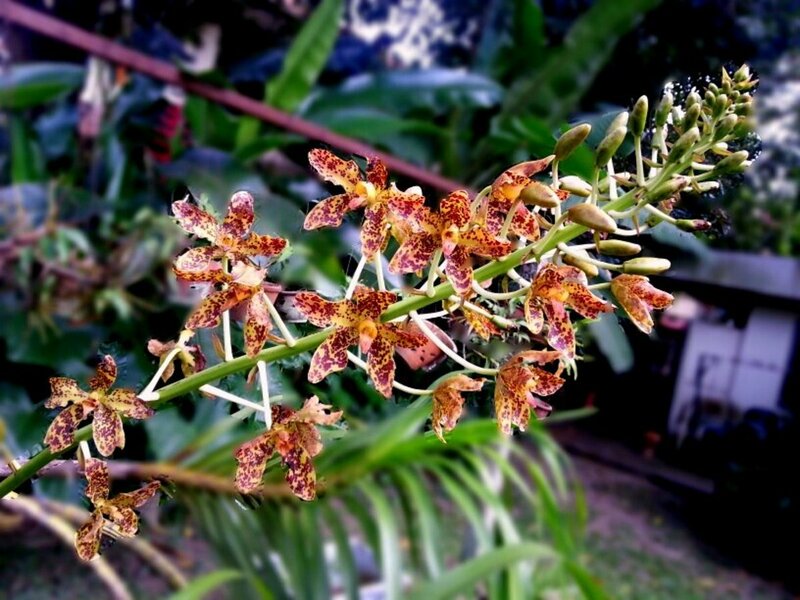 It just finished flowering. Out of three rosemary plants I've had in the herb garden, this is the third to blossom. They get purple flowers all over them and attract bees. I add freshly picked rosemary to pork roasts. Layer stems of rosemary on top and bake with your usual seasonings. 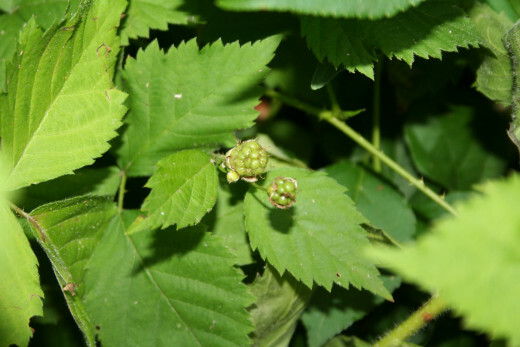 These are the first crop of this season, waiting to ripen. 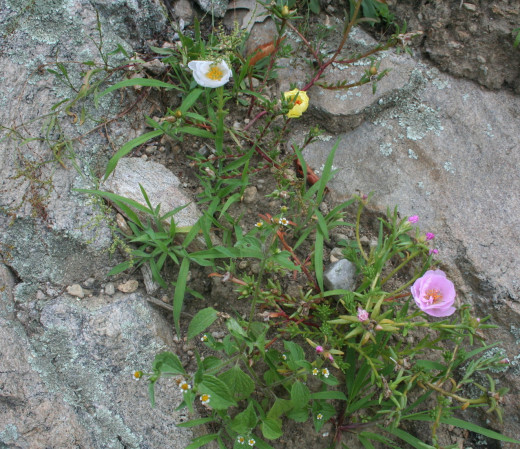 These flowers are an example of a hardy annuals. Annuals > do not come back year after year. Perrenials > come back year after year. I use to love to plant a small flower garden for my grandmother. She used to look at it out of her kitchen window. It was surrounded by oak trees so there was a lot of shade. I filled it with impatience which are small vibrant shade-loving flowers! 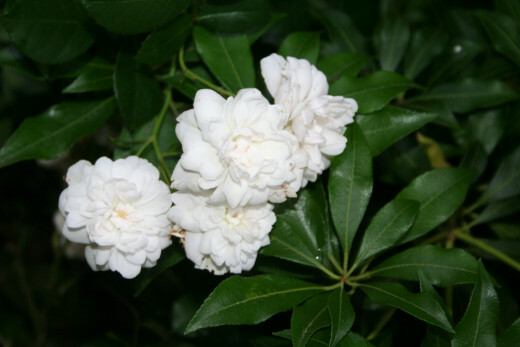 Shown above is an example of an annual flower. 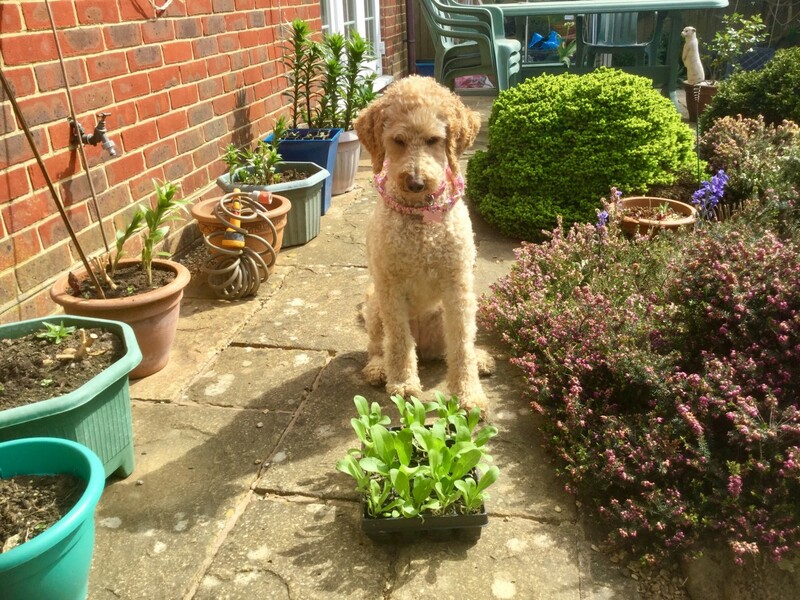 This particular flower is very hardy and needs very little water, making it a great choice for rock gardens. Whether you garden as a hobby, for relaxing, or sell your items at a farmer's market every weekend....you can create a simple and inexpensive potting bench by salvaging scrap furniture that you intend to throw out. Refurbish with a gallon of outdoor paint to eliminate wear and tear from weather. You can find furniture at thrift stores, free sections of local transfer stations, online, or right in your own home! Choose an area and measure your space. Pick a color theme that will work well with the surroundings and the color of your home. If possible, and if placed near a cement wall, consider painting the wall to make the furniture blend in. Think about the type of organized space you want to create. Do you want shelving? 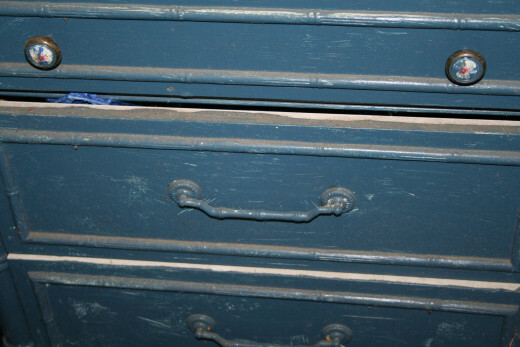 Do you want drawers? Do you want both? Try a dresser and hutch set or an old china cabinet without glass doors. Once everything is organized in your new gardening bench, remember to pick up some pretty flower pots and arrange them to look like a piece of art! I am not an expert gardener or landscaper. 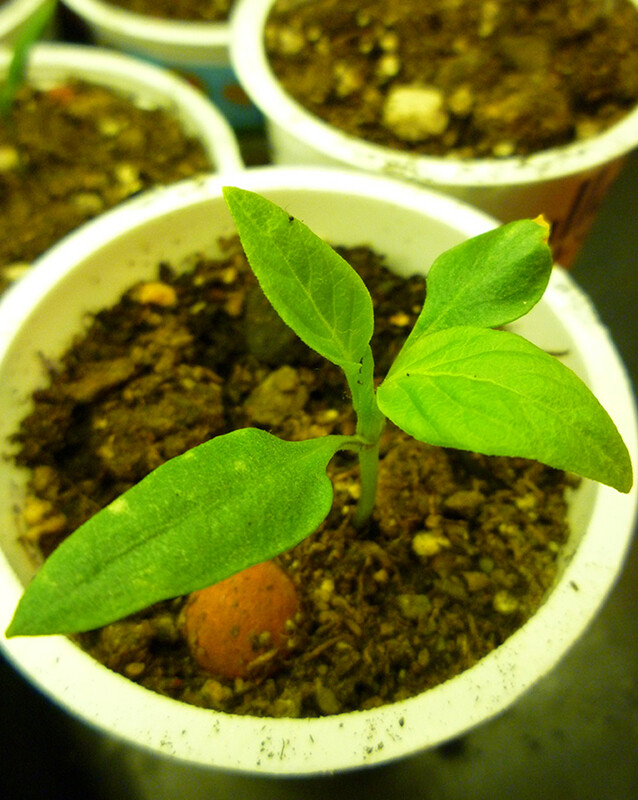 Gardening is a hobby. I find it to be very relaxing and rewarding. Watching the butterflies and dragonflies dance around the yard in the heat of the summer when the sprinkler is on high, makes me smile. Anyone can learn how to garden. 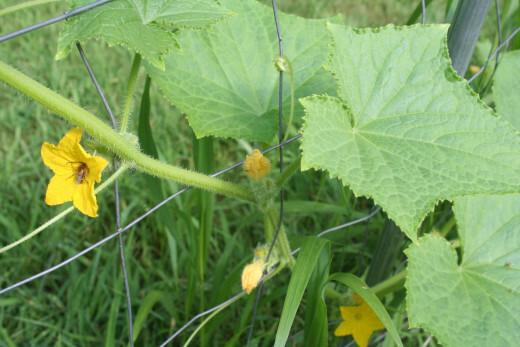 Even though I did grow up gardening, I never really learned how to grow flowers. It was something that I wanted to do which motivated me to do everything possible to figure out how. I started with a few landscaping books and read them. 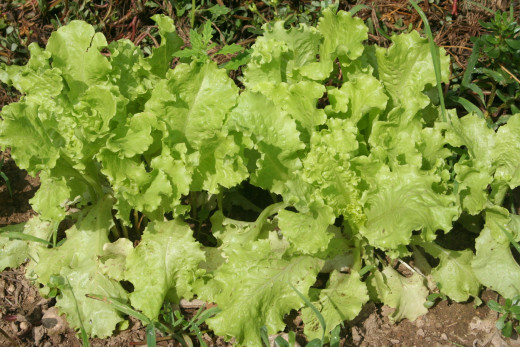 Before investing any money in plants which can be a costly mistake, read and learn about backyard landscaping and what plants grow in what climates the best. Sometimes the best design comes by mistake. 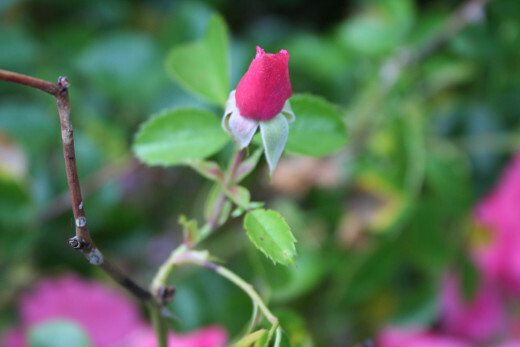 Your garden doesn't have to be perfect because everyone's garden is unique! Hi Ms. Lovejoy!Thanks so much for the information! I never did prune my lilac, but now I'm flenieg empowered to get going on this project. I'm spending time in my garden this afternoon, hoping to tuck everything in safely prior to tomorrow's major meteorological event (nor'easter/blizzard/hurricane). I think I'll tackle the larger trunks after we all make it through the storm.Regards! Very good idea using old furniture for something like this. I like anything that can be reused. Voted up and more. Thank you for your comment. 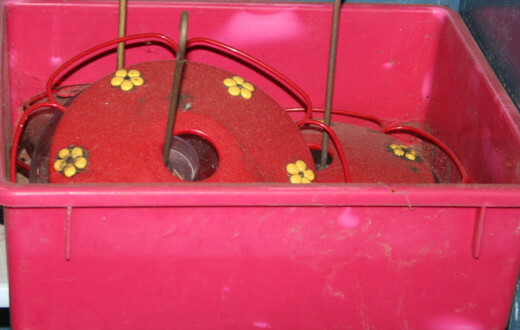 One time I took an old wooden bucket, tipped it on its side, and planted annual flowers coming out of it like it had spilled them out in to the yard. It was so pretty. Utilizing furniture outdoors for gardening purposes and/or decorations is fun stuff! Thank you! I find gardening so relaxing. It's a lot of work but really pays off with so much beauty. 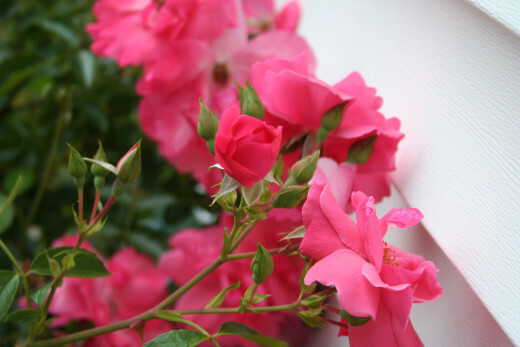 I love gardening and you have great information here. Nice pictures as well. Thanks for writing and sharing with us. Voted up!